Slightly undercooked spaghetti is firmer to work with the next day. Whether you have guests coming for dinner tomorrow and want to impress them with your to-die-for homemade pasta sauce, or you're trying out a new recipe for pasta salad that calls for chilling it before adding the dressing and other ingredients, you can cook the pasta the day before and refrigerate it until you are ready to proceed with the recipe. Refrigerated pasta lasts for up to three days. Just be sure to use plenty of water and to slightly undercook the pasta, particularly if you will be incorporating it into a dish that requires further cooking. Fill a large saucepan or stock pot with at least 4 quarts of water for every pound of spaghetti. Bring the water to a rolling boil over high heat and add 1 tablespoon of salt for each pound of pasta. Remove spaghetti from the package and fan it out into the boiling water, working quickly so that the water continues to boil and moving the pasta around with a long spoon or fork until it is completely submerged. Reduce the heat just enough so that the water doesn't boil over but is still boiling steadily. Keep moving the pasta around until the water has softened its outside starches, which will prevent it from sticking together. Cook the spaghetti for about 7 minutes, slightly less time than the recommended 8 to 10 minutes, and turn off the heat. Pour the spaghetti immediately into a colander and drain completely. Rinse the pasta under cool running water and drain it completely. Toss the spaghetti in just enough olive oil to keep it from sticking together during storage. Reheat the pasta the next day by plunging it for about 1 minute in a large pot of boiling water, then drain well and proceed with your recipe. 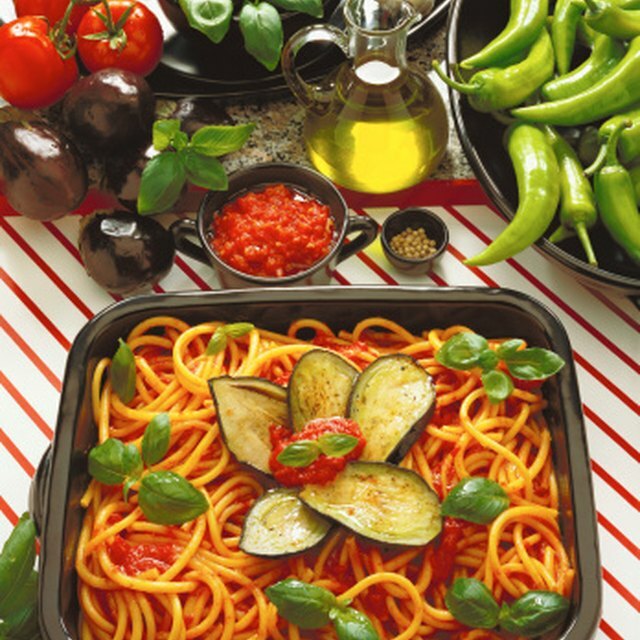 Refrigerating spaghetti the day before leaves you time to prepare a topping or sauce just before serving. Keep things simple by tossing the reheated pasta with a simple olive oil and garlic infusion, perked up with red pepper flakes. Serve thick slices of crusty Italian bread with spaghetti and meatballs, or dress up a summer barbecue with a tasty side dish featuring chilled spaghetti noodles, cilantro and diced cucumbers tossed in a blend of Italian dressing and soy sauce. pasta from sticking together, but others say that this produces slippery spaghetti that prevents sauces from adhering to it. 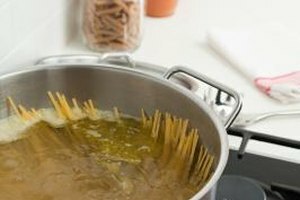 The biggest culprit in ending up with sticky clumpy spaghetti is not using enough water, as dried spaghetti swells to almost twice its original size during cooking. An alternate method of cooking spaghetti saves on energy and leaves you free to work on the sauce or other ingredients. Bring 4 to 5 quarts of salted water to a rolling boil in a large stockpot, stir in the dry pasta, bring the water back to a boil, cover the pot and turn the heat off. The pasta is done when it's tender and pliable but is still slightly chewy.